To see the different styles of Krav Maga T shirts available for purchase please see our Krav Shop. 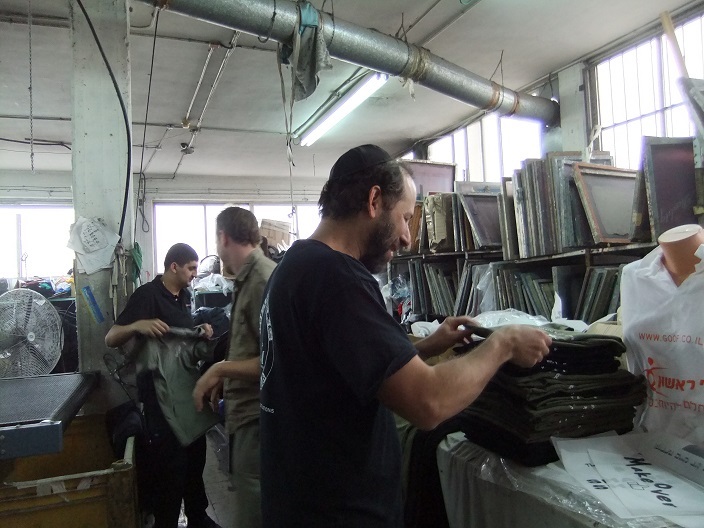 Our IKI Krav Maga T shirts are made in Israel, with pride, and love. I mean this. After searching around for a while, a fellow martial artist recommended this place all the way in Yafo, (Jaffa). It is rather far, they do not deliver, and I was rather reluctant to go there. Israel is a small country and we are not used to long drives. However once I made my first visit, I stayed with this company. I have now been going there for many years. Recently I brought in a friend, also a martial arts instructor, now she does her T shirts there as well. 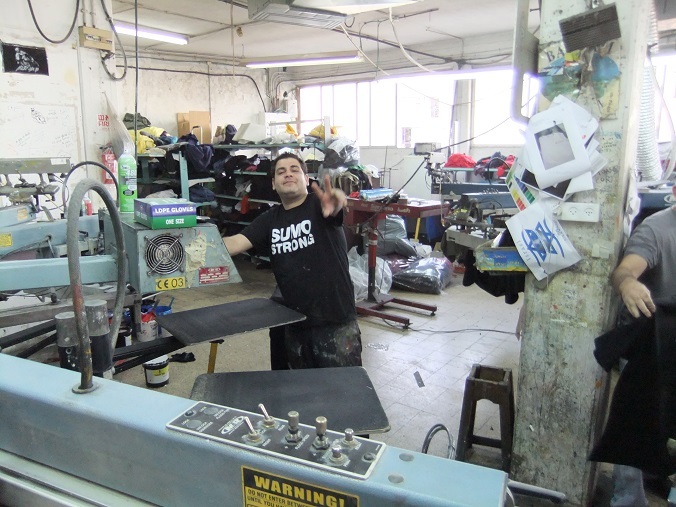 Ezra, one of the great guys at the factory that make it fun to come visit there. The staff at Silon 2000 are a very special group of people, we have developed a special relationship over the years. We have developed bonds of friendship and trust unusual in the business world. When I am at the factory I am at home. The place is managed by Yisrael and Moshe, two great guys and proud Israelis. Humble and unassuming they never try to make a "sale". Over the years I have come to learn that they have had opportunities to make cheaper quality T shirts and to import T shirts from Third World countries. They have chosen not to. They do not compromise on quality. I have found that even after many washings the shirts do not shrink and the colors and printing do not fade. One American student recently wrote me "I have been wearing my Krav Maga T shirt weekly for two years now (Ashley)." 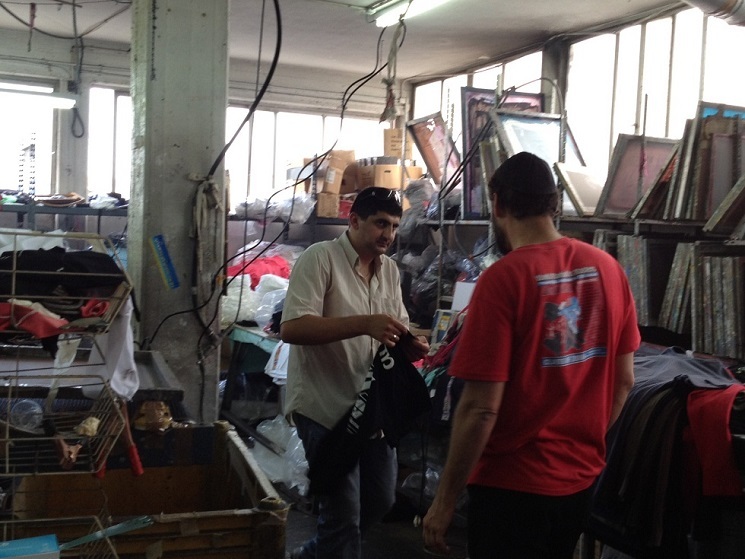 All the T shirts in this factory are 100% Israeli from start to finish. The cotton comes from Israeli sheep at Israeli kibbutzim (collective farms), the material is made here in Israel, and here it is cut and made into T shirts. Here everyone feels like family. In all my years here I have never seen a worker criticized or insulted. Sometimes mistakes happen and merchandise is lost. No matter, no one gets angry. Once a dozen T shirts were made with extra writing (for a certain schools' contact information) when that writing should have been deleted already. It took a great deal of work to correct this mistake yet no voices were raised, no one was made to feel bad. The owners and managers are one with the "staff". No one pulls "rank" on another. If the manager/owner is not talking to a client, he joins in with the factory work. 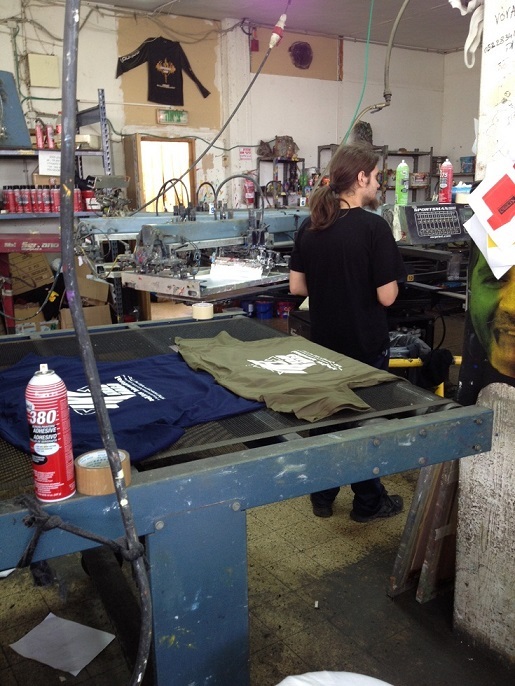 Iris and David, Krav Maga students who cycled here all the way from the Netherlands, helping out at the T shirt factory. They left with brand new IKI shirts that they helped make. 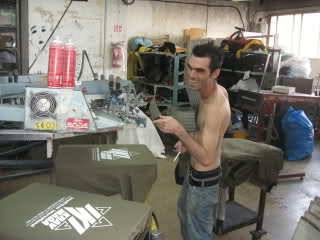 IKI Head instructor Moshe Katz working at the factory, we all work here, no one gets a free pass. Throughout the day we drink Turkish coffee and chat as we work. Smiles are everywhere. To me this is a day for hanging out with friends. 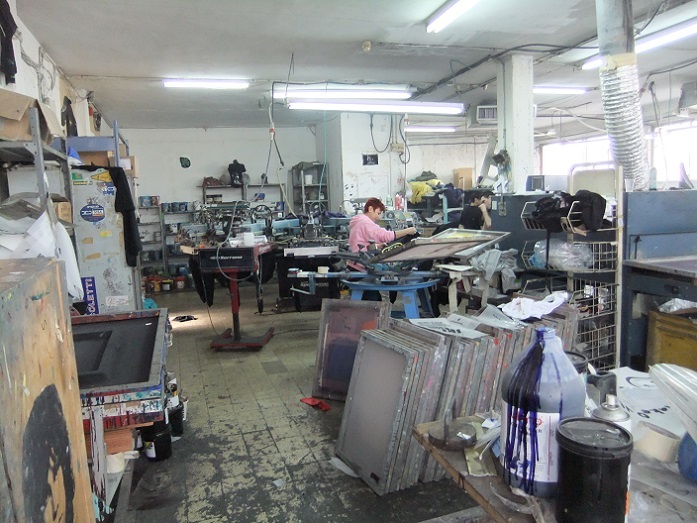 So you see, the T shirts are made in a very happy environment. We hope you feel some of Israel, and some of this happiness, when you wear these shirts. 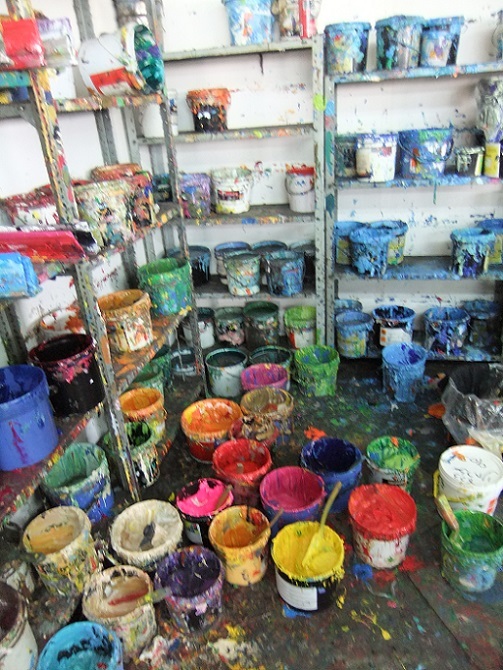 When I return from a trip abroad my friends at the factory are anxious to hear stories. Where did I go? Who is wearing the T shirts? Who bought the 5XL shirt? Did I sell a lot? What kind of people did I meet? Did they like the T shirts and appreciate the quality? 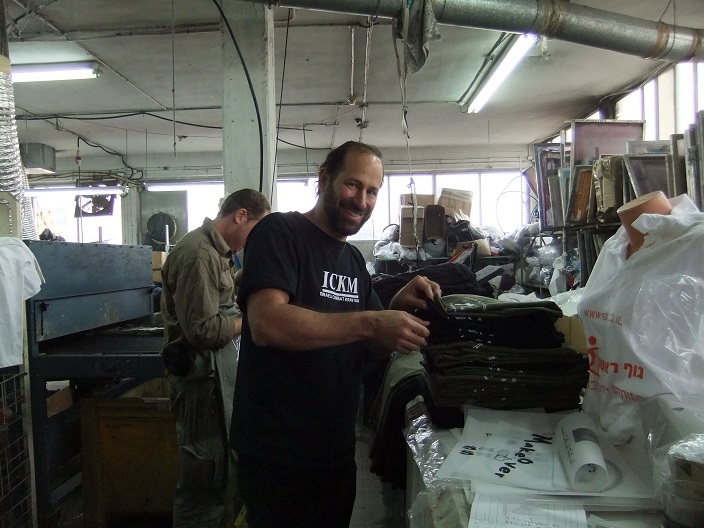 When you buy an IKI Krav Maga T shirt you are supporting IKI, Israel, and the wonderful staff at the factory that has become a home. 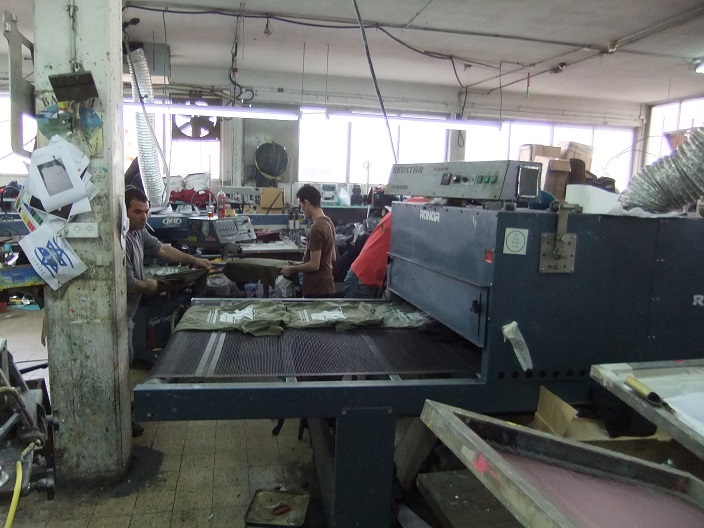 To me this factory represents some of the things I love so much about Israel; Chana is from Bulgaria, Chanan is from Ukraine, Moshe and Allon are a mixture of East and West, Middle Eastern and European. 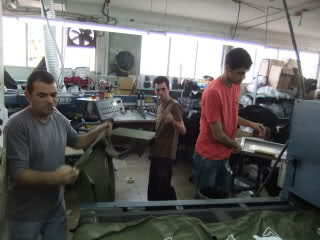 But none of this matters, here we are all Israelis, working hard, happy to be in Israel, earning an honest wage. Recently Alon, a wonderful guy, left the factory. We were sad to see him go but he had a dream. Everyone should have a dream. His was to open a "Chumusiadah", or a Chumus/Humus restaurant. We wish him well. 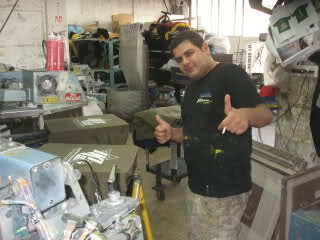 If you come to Israel to train you are welcome to join me at the Factory, it is an Israeli experience. Turkish coffee on the house. 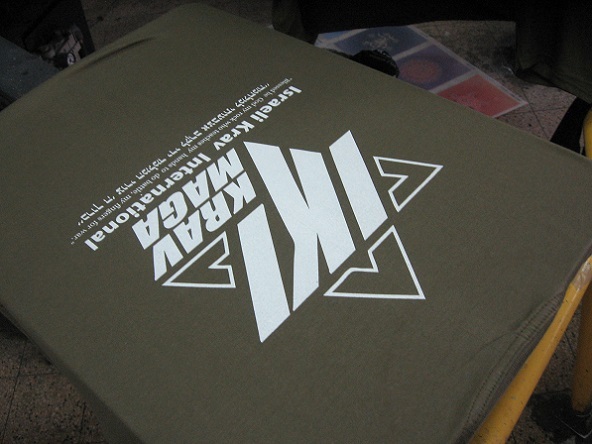 Order an IKI Krav Maga T shirt, made with pride in Israel, $16 plus shipping.